With less tha a week to the February 16 Presidential and National Assembly polls, the Federal Government has told the United States (US) not to cross the line as far as the elections are concerned. The government specifically communicated to the US to be careful not to cross the line between observing and supporting the electoral process and appearing to be partisan and interfering in the process. Minister of Foreign Affairs Geoffrey Onyeama gave the government’s position during a closed-door meeting with the Senior Director for Africa and Special Assistant to the United States’ President, Cyril Sartor, on the sidelines of the 32nd Ordinary Session of the Assembly of the Heads of State and Government of the African Union in Addis Ababa, Ethiopia. The Federal Government had accused the United States, the United Kingdom and the European Union of interference in domestic affairs, following comments on the suspension of the erstwhile Chief Justice of Nigeria, Walter Onnoghen. Earlier, the United States and the United Kingdom had sent out a strong warning to would-be offenders during the forthcoming polls, threatening visa sanction. Speaking after the meeting, Onyeama said: “Yes, I met a representative for Africa on the US National Security Council and we discussed elections in Nigeria and I pointed out the government was absolutely determined to have free, fair, credible and transparent elections, that Mr President has invested in that. Onyeama said he had reassured the US that President Buhari is determined that Nigeria has good, free and fair elections. The minister said that during the meeting he raised the issue of the Super Tucano Aircraft which the Nigerian government has paid for and the US Government has agreed to provide to Nigeria. 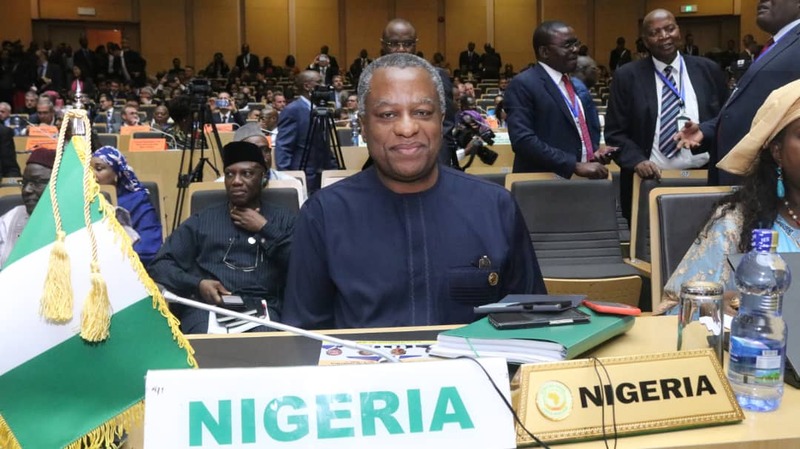 Onyeama said he pointed out to the US Government that the timeline for the delivery was still a little bit long, over a year and half, whereas the nation is presently in need of the Super Tucano. Onyeama said: “He said that they were aware of that situation and they would be looking into it. “I also pointed out to them US sanctions against Russia whereby no country was allowed to enter into any military agreement and purchases of equipment from Russia, even if those contracts had been signed before the US law came into effect. “And I pointed out to them that we had subsisting contract with Russia and we wanted them to kindly grant us a waiver for them. Onyeama further discussed with Sartor increasing trade with the US, and in particular having greater access to the US market. See Onyema and his disastrous administration warning US not to cross the line as if they are capable of engaging the US in any manner if the US decides to do anything. This could be likened to one of their kleptomaic governors warning foreign election observers that they will be reduced to body bags if they dared interfer in the process. ONYEAMA please, don’t let these fulani herdsmen push you into trouble with US . They have become jittery. Please, fine tune your approach to US . APC has been rejected by the entire world.